Remember this? I had one back when I was 12 or 13 and I remember it was practically a must have! 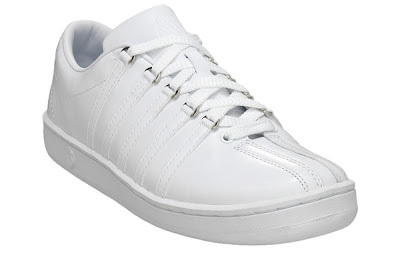 Girls in school who first wore Tretorns graduated to K-Swiss when everyone started wearing Tretorns. Snobs start early no? Then Cole Haan and Bass loafers became the next big thing and sneakers just weren't cool anymore. I remember my best friend Nina and I used our K-Swiss insoles to make our loafers much more comfy! Yeah, I still remember how comfy those blue insoles were! Well whatevs, guess what! K-Swiss is back! The classic white ones plus a couple more new designs! "A brand known for innovation, quality, performance, and style, K-Swiss is integrating the classic look with contemporary touch to suit the new generation’s taste in apparel. Just think K-Swiss Classics. First introduced in 1966, this K-Swiss signature design with its characteristic five stripes and the D-rings still holds that elegant and fashionable imprint 40 years later. A timeless piece that represents style, authenticity, and individualism, the K-Swiss Classics has transcended from being the first leather tennis shoe to being a fashion staple both on and off the court. Joining the Classics is the entry of the Surf and Court design, another timeless offering that complements K-Swiss’ originals collections. The Surf and Court design is sure to style women up anytime, anywhere. With its nautical classic design, soft full-grain white leather, and nautical stitching, Surf and Court epitomizes the elegance of the K-Swiss sailing shoe. Heritage K-Swiss details like the iconic five stripes, D-rings, and discreet script are likewise included in this design. K-Swiss also touches on performance in its 2009 lineup. 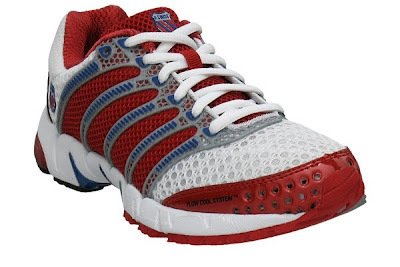 Runners may want to check out K-Swiss’s K-Ona model. Its 9 oz. ultra-light, stable running shoe with its exceptional cushioning makes it a perfect partner for training, road races, and triathlons. 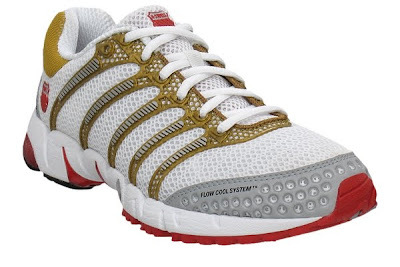 They may also want to try out K-Swiss Run One miSOUL Tech model. A versatile running shoe that features a modular, interchangeable sole system engineered for customized performance. Completing the lineup is K-Swiss Grand Court, an athletic-inspired shoe made with a fashionable design. 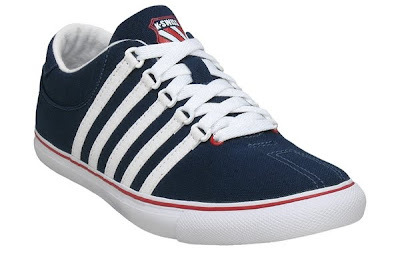 It features wider stripes on the side and the classic K-Swiss elements plus synthetic leather upper and a rubber sole. Check out the Classics and the new K-Swiss designs. Now available at all Planet Sports outlets, Athletes Foot stores, and Olympic Village stores nationwide." LOL! yey, we just bought some at marshalls 2 weeks ago. got them for a great price. im so happy you posted this! i have to show my hubby.